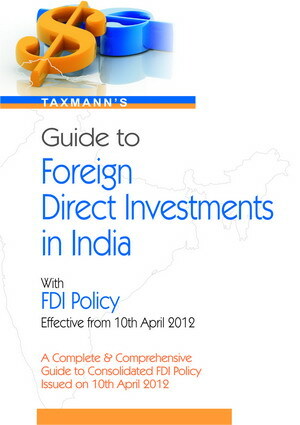 Taxmann’s Guide to Foreign Direct Investments In India is a complete and comprehensive Guide to Consolidated FDI Policy issued on 10th April, 2012. Liberalisation in industrial policy and policy towards foreign investment in India was initiated in 1991. The liberal policies introduced in 1991 are continuing and Indian economy is becoming more and more open and liberal every year. Policy in respect to foreign investment in India (FDI) is regulated by Department of Industrial Policy and Promotion (DIPP) (FC section). So far, the practice followed was to issue press notes in respect of industrial and foreign investment policy. The press notes were scattered and a single policy document was not available.